New Zealand cricket fans taking advantage of the Border-Gavaskar Trophy betting action in India have a new factor to consider for the third Test in Ranchi. All-rounder Marcus Stoinis will make his Test debut for Australia as a replacement for an injured Mitchell Marsh. New Zealand punters will know the name Stoinis, who won his first Australia cap in a T20 against England in 2015. The 27-year-old from Perth currently plays for Victoria, Melbourne Stars and Kings XI Punjab in the IPL, but what Black Caps’ supporters will remember most is his international ODI debut in the Chappell-Hadlee Trophy in January this year. New Zealand batted first in Auckland, with Stoinis contributing respectable but not earth-shattering bowling figures of 2 for 49 in 10 overs. The visitors started their innings chasing 286, but with Finch, Head and Handscomb all bundled out for single figures and number five Maxwell making a then-top score of 20, Australia were in deep trouble, at 5 for 54 in the 13th over, when Stoinis came in at number seven. He proceeded to chasten the Black Caps’ bowling attack with a heroic 146 off 117 balls, finishing not-out after the 50th over. New Zealand still won the match by 6 runs, and would eventually take the series 2-0. However, Stoinis’ knock made history as the highest score by a number 7 batting in the second innings of a losing 50-over match, and the second-highest score by any number 7 or lower in ODIs ever. 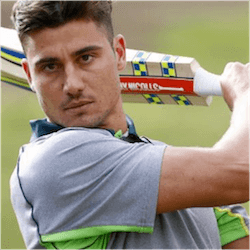 The Baggy Greens will need Stoinis’ skills with both ball and bat, if they are to recover the lead in the series. As their embarrassing collapse on day four of the bitterly contested Bangalore Test showed, India’s pitches can play havoc on the final two days. After a rousing 333-run win in Pune, Australia’s ignoble slump to 112 all-out in their second innings at Bangalore handed India a 75-run equaliser. It was also a match marred by acrimonious controversy, and a second below-par performance from Western Australia player Marsh. He has been battling a shoulder injury all summer, so team management has decided to rest him and field a fully fit team for the crucial final Tests of the Trophy.